At RCN, our goal is to help our clients become more productive through the use of cloud technologies like Google’s G Suite. One of the best ways to do this is to help them save time on the tasks they’re already completing every day. I think we can all agree that email takes up a big chunk of our time, and we can easily spend hours in our inbox not accomplishing anything. But what if you had an inbox that knew how you worked, could offer suggested responses, remind you when emails haven’t been responded to, and help you organize your to-do list for the day? 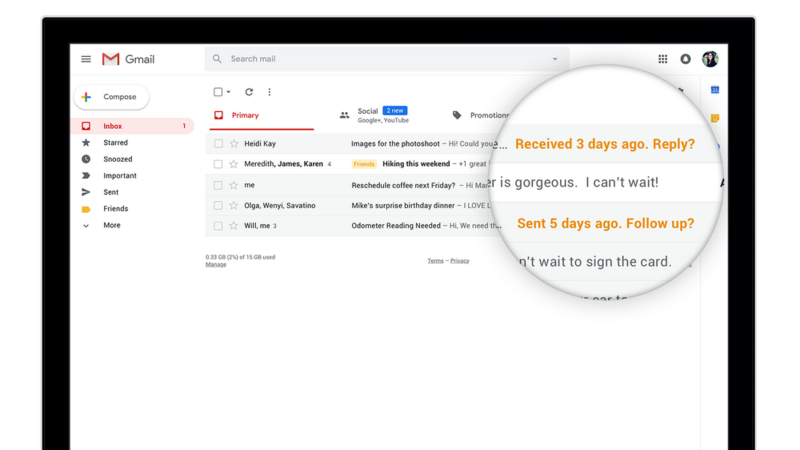 Google rolled out a (mostly) all new Gmail earlier this year packed with tons of cool features and a fresh redesign designed to help you save time and be more organized. 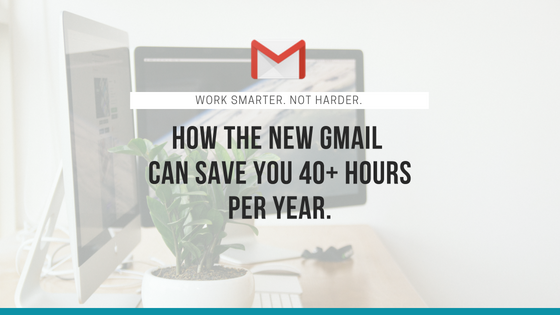 All of them are very useful and time-saving, but most people don’t know you have to turn this new Gmail on before you can use it. We’ve rounded up a list of all of the new features and how to use them. 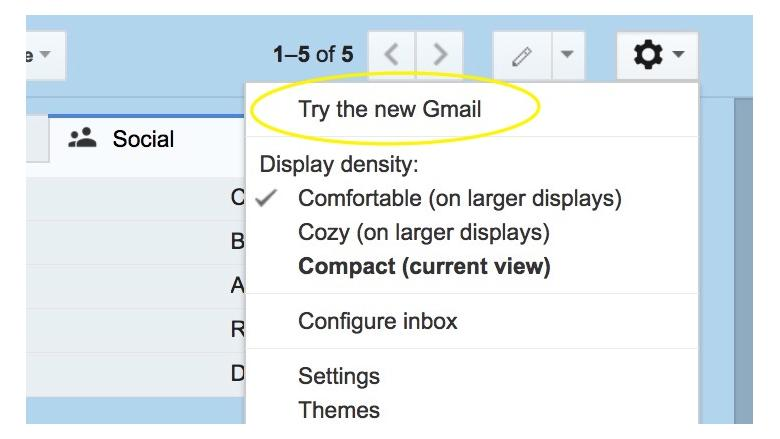 To kick things off, there is a new Gmail design that you can change from the settings menu. If you click on the settings gear on the upper right-hand corner, there is an option to “try the new mail”. 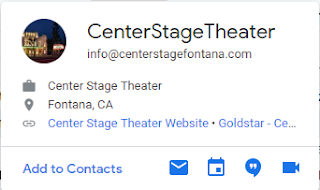 If you still don’t see this option, you may need to contact your G Suite administrator to help you turn it on for your company from inside the admin console. Google has added “Hover Actions”. When your cursor hovers over an email, a row of options will be displayed on screen to the right of the email’s subject. The options within include “Delete, Mark as Read, Snooze and Archive. For Calendar invites, the hover action can be used to RSVP or decline. Now, no matter where you put your mouse cursor on the screen, there will always be something to utilize. With the new panel located to the right of the email list there are small icons for Google Calendar, Keep and a Task feature. You don’t have to open any new tabs for these. The panel will slide out so you can stay in the zone with your inbox all while scheduling meetings, keeping notes, or making to-do lists. You can also utilize Tasks by using drag-and-drop to add emails. Perhaps my favorite feature, you can now add emails to your tasks with the click of a button. Adding to tasks will also attach the emails so you can quickly reference back to it from the task bar without searching through your inbox again. This is perfect when I don’t have the time to gather all of the information needed to respond immediately, or when I get a newsletter/promotional email that I want to read eventually. In the hover menu, the feature Snooze allows you to hide email messages from view for a specified amount of time. Feeling a bit tired to start the day and don’t want to deal with Becky from accounting just yet? Just Snooze that email and save it for a time you feel up to answering. If you’ve been using the Gmail mobile app, these features won’t be completely new, but Gmail has now brought them over to the browser. When you click on Reply, there will be three suggestions of smart responses that can be added to the email with a single click. You also have the option to add to the reply. Plus Mentions is an awesome new feature. With it, you can add a person to the CC field without leaving the body of your email. When you start typing name enter a plus sign to select the person’s name or email address from the drop down list. This feature is sort of part of the Hover Actions. There are customizable hover cards for contacts and a new display density to give more information in your contacts. 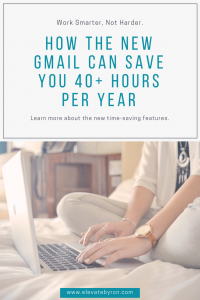 Instead of needing a chrome extension to get around your email without an internet connection, offline support offers the option to search, compose, reply, archive and delete up to the last 90 days worth of emails in your email without any kind of connection! Forgetting to reply to emails is a common issue. With this new email feature, after a certain amount of time has lapsed, Gmail will remind you about taking action. Your mailbox can be flooded with newsletters you didn’t sign up for. This new tool will learn which emails you interact with and suggest which ones you should unsubscribe from. For mobile users, you’ll have the option to decide which emails prompt a push alert, cutting away all those unnecessary interruptions through the day. It may not seem like a lot, but those little tasks can easily add up to big time savers, especially if you have an office full of staff saving just an average of 10 minutes per day. 10 minutes x 10 employees x 5 days/wk x 50 work weeks = 416.6 hours per year saved! That’s enough for every employee to have another weeks worth of productivity.